After nearly a century in their namesake tower, the Chicago Tribune relocated to five floors in Prudential Plaza, a midcentury office building facing Millennium Park. The change was a big one for the 171-year old Tribune, and we were honored to help with the transition. The flexible new space gives the newspaper and digital content headquarters a functional workplace distinctive to their unique history and fit for today’s fast-paced world of publishing. 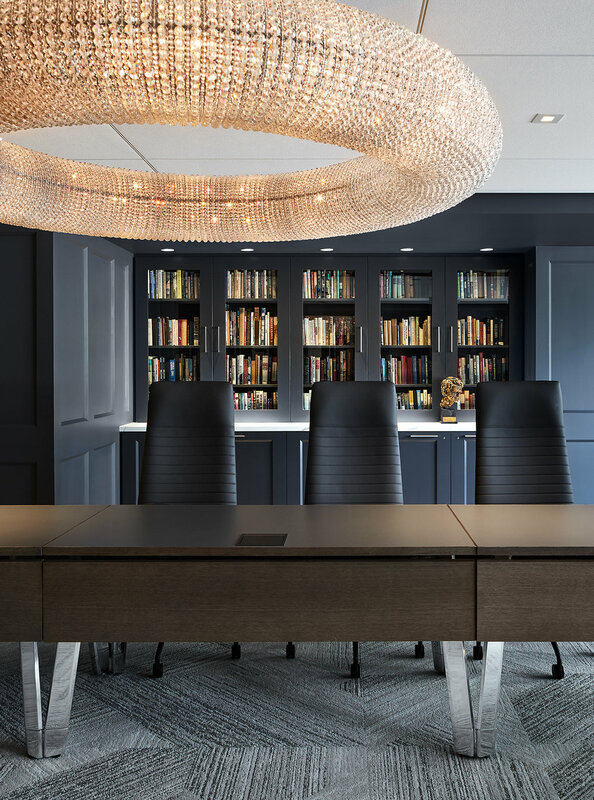 This project was particularly poignant to Eastlake because our studio was located above their offices in the Tribune Tower for 30 years, and in that time we worked with them on several smaller renovation projects. Not only could we empathize with the daunting relocation, we felt the buzz of energy in the space that made a daily newspaper and created a myriad of digital content. We understood that the design for the new Prudential Plaza headquarters needed to be the perfect host to that frenetic creativity. Our open plan encourages collaborative work practices, and allows for all of the needs of a modern media center—from a state-of-the-art breaking newsroom, to a test kitchen, to personal lockers and adjustable-height desks. 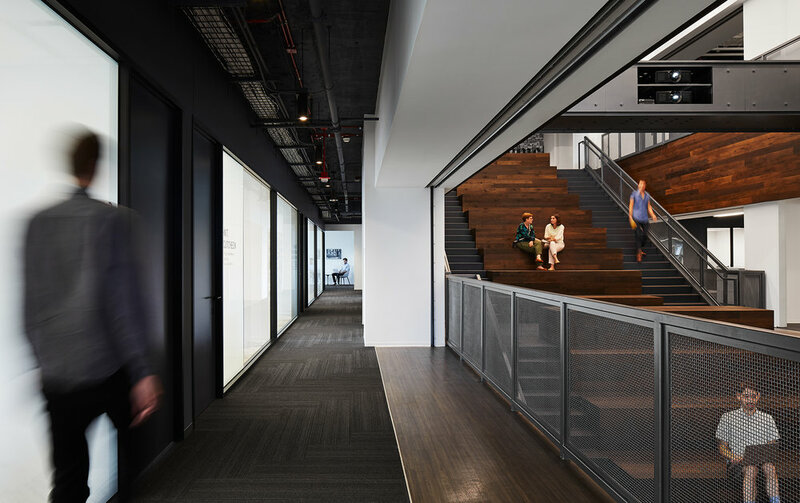 Street-facing conference rooms reflect the core values of transparency and honesty, and the stair—a major architectural addition to the building— creates a strong statement of urban permanence. The Tribune’s new private entry faces Stetson street, a stone's throw from Millennium Park and some of the Loop’s best cultural assets. Flannery O’Connor’s powerful words, “The truth does not change according to our ability to stomach it,” and other quotes wrap the low corridor leading into the larger reception space, and reflect those in the lobby of the Tribune Tower. Stainless steel and marble finishes are warmed by a pair of sculptural chairs and a bronze plaque commemorating a historic front page. Past the reception desk, editorial conference rooms reserved for VIP guests and press conferences embrace their proximity to the public sphere outside. 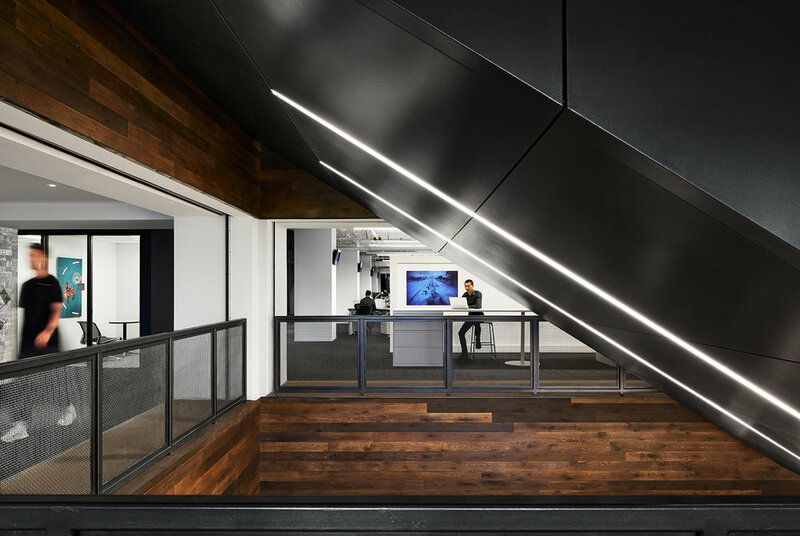 In an attached, open reception area, glassed-in multimedia studios surround the base of the mammoth staircase leading up to the editorial floors on the entry area’s south side. A few steps up, a 4,200-square foot café, open to the floors above, allows staff to retreat from the busy production areas. The mail room is also located here, along with more conference rooms, encouraging daily engagement and interaction between the different departments and publications. On the landing of the third floor, a photomosaic mural of some of the Tribune’s award-winning photographs leads into the state-of-the-art breaking newsroom. Workstations are arranged by team beneath a mesh ring of 42 television screens, allowing staff to monitor multiple channels simultaneously. The room flows into additional open workspaces, huddle areas for private calls and small meetings, and casual seating areas. 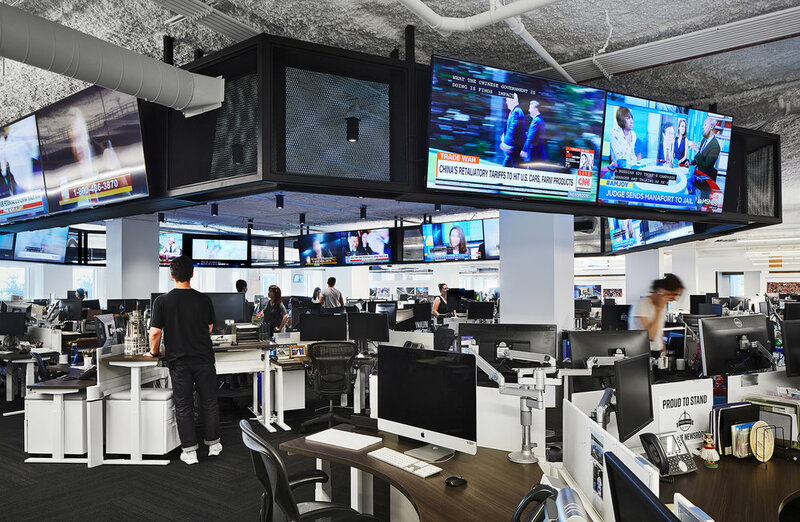 Chicago magazine, RedEye and other Tribune-owned publications inhabit the fourth floor, with a similar layout designed with to maximize the natural light and keep sightlines open. We made sure the writers, editors and photographers had a variety of places for meetings and heads-down work. 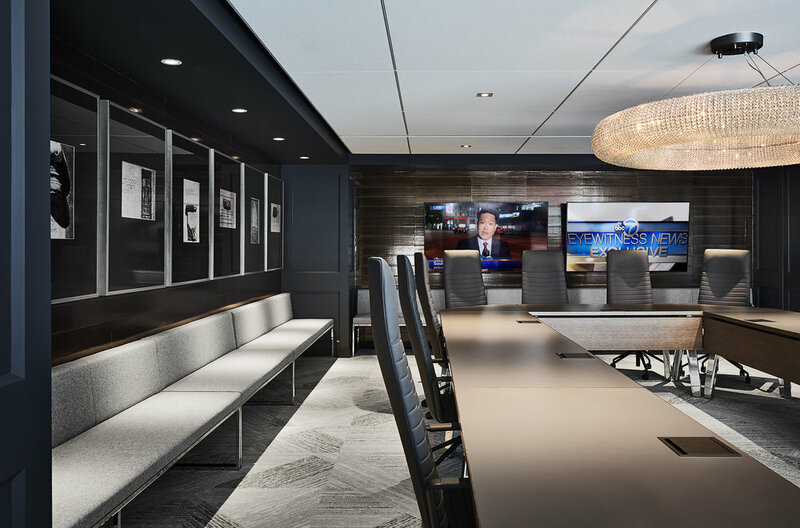 Combined, the ground level, mezzanine and editorial floors have 43 phone rooms, 6,000 square feet of collaborative work space and numerous formal and informal conference rooms, many of which are named for Pulitzer Prize-winning stories and staff. Working with the Tribune's executives, Eastlake dug through storage units and archives to source material for the new design, including an antique conference table from Tribune Tower's board room and throwback newspaper printing plates. Archival photos, comics, front pages and publishing artifacts are woven into a high contrast, monochromatic scheme, displaying the numerous contributions made throughout Tribune’s long publishing history. Photographs of the stones from Tribune Tower's facade and a library of books by Tribune-affiliated authors speaks to the newspaper's lineage and gives gravitas to the new space. Early in the design process, the vertical series of floors rising from street level were envisioned as a hive of cultural production, with the core artery being a monumental staircase. Millwork steps, made from reclaimed urban oak trees sourced around Chicagoland, are more than just a dramatic path from the ground to the creative areas—they provide a flexible, dynamic place for communication with more than 1,000 square feet of stadium seating facing a projection of the 24-hour news cycle. Truly monumental, the communal staircase spans the greatest distance of any in the city. Finished in 1955, One Prudential Plaza was the tallest building in in the city post-Depression. It marked the beginning of Chicago’s office tower construction boom, making it a symbol of modernity and midcentury ambition. The building’s top floors are still known by longtime Chicagoans for having the world’s tallest escalator leading to a glassed-in observation deck, a hot spot to see the city for many years. 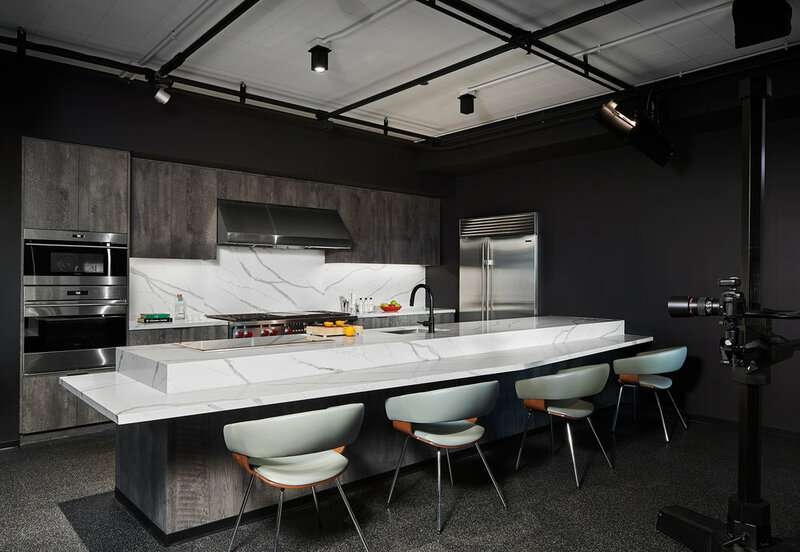 Now, the Tribune inhabits the 40th floor of the building, where we created executive workspaces, a 2,200-square foot event space and a test kitchen equipped to photograph and record cooking demos. In order to make the once dark floor more functional and pleasant, three new large windows were punched, altering Prudential’s south-facing facade and expanding the views of Millennium Park and the lake.